Much of the hand-wringing about Arianna’s ascension has focused on her liberal political views. 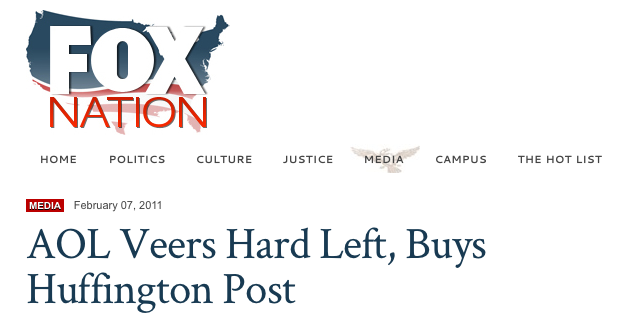 (The headline on the Fox Nation website read, “AOL veers hard left, buys Huffington Post.”) I’m more worried about whether The Huffington Post‘s history of publishing baldly inaccurate stories about science and medicine will now infect the rest of AOL’s content. Unvaccinated children do not pose a threat to vaccinated children or their families. The notion that people should base medical decisions on what is “right for them” is particularly problematic in a public health context, where individual choices cannot be cordoned off from each other. Consider the case of Julieanna Metcalf, a fifteen-month-old, fully-vaccinated girl who was taken to the hospital on January 23, 2008 with what her mother thought was a particularly bad case of the flu. It was only after extensive tests that doctors discovered that Julieanna had a compromised immune system that rendered the vaccine for Hib ineffective. By the time she got out of the hospital almost a month later, Julieanna had suffered multiple seizures and had a buildup of fluid in the brain so dangerous it required emergency surgery. She’d also lost all of her motor skills—including the ability to swallow—and will require multiple immune globulin injections each week for the rest of her life. Even with her weakened immune system, Julieanna might not have caught Hib if everyone around her had had their shots, but the Minnesota community in which she lived was a place where the same ethos emanating from Gordon’s and [Bob] Sears’s waiting rooms and [Oprah] Winfrey’s couch had taken hold. The outbreak that ensnared Julieanna also resulted in the hospitalization of four other children. One was a baby who was too young to have been vaccinated. The parents of the three others had all chosen not to vaccinate their children; one of those, a seven-month-old girl, died of the disease. So: does this latest move mean that HuffPo-style quackery will be disseminated even more widely? Or will the new Huffington Post Media Group be more careful about monitoring the line between falsehoods and opinions? * It’s been three weeks since Salon officially retracted “Deadly Immunity,” RFK Jr.’s 2005 error-laden piece about mercury in vaccines. Gordon still has the piece up on his site. David Kirby was probably the most prolific of the weak-on-science autism bloggers for Huffington Post. There was a time when you could count on a post every three months reporting on the latest California DDS data and claiming that it supported the epidemic. Then, slowly, as the predictions failed, the story changed. Not the conclusion, mind you. The conclusion was always the same: mercury caused an autism epidemic. What really bothered me about David Kirby was his style. He would take the reader on a series of “What if” type questions. After about 5 “what if” decisions, the probability that the answer was correct was pretty small. But, the audience ate it up. For many of these bloggers, HuffPo was sort of a symbiotic relationship. They got to publicize their groups’ messages, and HuffPo got free content and long discussions, which guaranteed that ads were shown multiple times. The Huffington Post rarely, if ever, stuck to their stated creed of correcting obvious factual mistakes. I am waiting for Andrew Wakefield to take his place as a HuffPo blogger. Thanks for posting links to those two excellent, sensible articles by Dr. Jay Gordon. I sure hope that Huffpo keeps posting articles by Jay Gordon, David Kirby, and others who speak out regarding our vaccine program’s excesses. Funny, you did just what Dr. Gordon was talking about — posting stories of rare serious harm from cases of Hib. I could post stories of serious harm from vaccines, too. To analyze the risk/benefit ratio of vaccines one must look at both the risks of the disease and the risks of the vaccines. Instead, risks of vaccines are simply labeled as “coincidence” and “anecdote” and swept under the rug. I believe that vaccines are a very important weapon in the fight against communicable diseases, but like any medical treatment they can have adverse reactions which must be studied. We really understand very little about the longterm effects of giving so many vaccines at such a young age. Have you read, or would you please read the Panic Virus? It was written to respond to statements like yours. There is a big difference between anecdotes of the results of not vaccinating and what Kirby and Gordon write. First of all, much of what Kirby and Gordon warn about, such as autism, is not caused by vaccines, and their continued insistence that vaccines are the cause is not sensible in the face of the evidence. Other risks are real but are minor compared to the risk of not vaccinating and contracting the disease. If Kirby and Gordon were sensible, you would expect some perspective, such as you are more likely to be injured in a car accident or from playing baseball than you are from a vaccine. Instead they choose to overhype the risks. Second, vaccines are already very well studied and understood, and when a doctor gives a vaccine he can explain the effectiveness of the vaccine and the risks involved. Kirby and Gordon never acknowledge the personal risk of not getting vaccinated, and especially miss the danger the unvaccinated pose to the rest of the population. The Metcalf story is useful to remind people that it’s not just a personal choice. A decision not to vaccinate yourself or your children can have far reaching effects. No one anecdote is convincing, but this story is part of a larger data set that shows when vaccine rates go down, disease rates go up, even among the vaccinated. Anecdotes about adverse reactions would be fine as long as it is stated the chances of such reactions are low. That is never the case with deniers. Finally, because vaccines are so well studied, researchers are able to separate the real risks and causes from the imagined ones. It is not “sweeping it under the rug” to say effects seen after receiving a vaccine are a coincidence. Every case is different, but through science we have good reason not to suspect vaccination as a larger culprit. There is also very little science supporting the notion that we are giving our children too many vaccines at once. This was invented out of whole cloth from vaccine deniers who wanted a catchy slogan (Too Many, Too Soon). – How to identify a vaccine injury. If a baby begins having seizures after receiving some vaccines, how do you tell whether vaccines caused the seizures? It seems to me most vaccine defenders simply have the attitude that if you can’t prove that it was the vaccines, then it wasn’t the vaccines. – What is a safe level of mercury that can be injected into an infant? Thimerosal was grandfathered in when the FDA was first formed, and was never subjected to the kinds of testing that should have been required. – How many vaccines is it safe to give at once? The CDC says lots are o.k. — 6, 8, even 12 if “catching up”. Paul Offit says 10,000, based on a silly theoretical mathematical formula. The CDC admitted that vaccines are not tested together. – How does the rate of health and neurological conditions compare among vaccinated and unvaccinated children? And don’t tell me it would be impossible to do this study. Yes, you cannot do a gold standard prospective study, as parents need to have informed choice on whether and when their chidren are vaccinated with which vaccines. But a retrospective study could be done. When I want links to articles or studies about something medical, including vaccines, I usually go to quackwatch.org and do a search on the topic. The articles within are heavy with links to supporting studies. Some choice quotes… “The safety of aluminum has been established by experience during the past 70 years, with hundreds of millions of people inoculated with aluminum-containing vaccines.” Now that’s not a rigorous scientific trial, but I think the record can speak for itself. “Because aluminum is one of the most abundant elements in the earth’s crust and is present in air, food, and water, all infants are exposed to aluminum in the environment. … However, because large quantities of aluminum can cause serious neurologic effects in humans, guidelines were established by the ATSDR.” In other words, there is a lot more aluminum in nature than there is in vaccines. But we know it is dangerous so we don’t put lots of it in vaccines. Sounds like exactly the study Dr. Sears was looking for. Not to be mean, but it took me about twenty minutes to find it, and I’m only responding to a comment on someone else’s blog. I’m not presenting myself as a doctor for a magazine article advising people on how to keep their children healthy. – Thimerosal has been removed from most vaccines for almost a decade. Similar to aluminum, thimerosal had a safety record of almost 70 years before paranoia crept into the public and removal was demanded. No major study has shown thimerosal was a dangerous additive to vaccines. I have found no evidence showing that the FDA approved thimerosal without testing. – I am sure plenty of studies have been done comparing neurological disorders in vaccinated and unvaccinated populations. But such a study would not link any specific disease to vaccination. It would merely be a correlation. Studies which have tried to target vaccines as the cause of a given disorder have come back largely negative. – Animals studies can be useful as models for future human studies, but they are not conclusive for proving safety in humans. The first link you provide is to a pilot study done by Thoughtful House. Pilot studies are called such because they are starting points for future rigorously designed experiments. Often the sample sizes are small and the tests they performed are poorly controlled, sometimes unblinded. They should not be referenced as definitive answers. But they are a favorite of deniers who start with a conclusion and perform the study to prove their point. Also, in a serious discussion about the dangers of vaccines, it is wise not link to notorious anti-vaccine groups like Age of Autism. I will accept honest attempts at science and research even if they claim vaccines are not safe. I do not accept arguments by a group who refuses to change their arguments in the face of mountainous evidence. Mind you, I’m not saying to do away with all vaccines. But I do believe we need to be more selective, and take into account the risks as welll as benefits. – How can vaccine injuries best be treated? To answer one question–how much mercury can we inject safely? When it comes to autism, the answer is: Something much higher than that in the old pediatric schedule (which totaled something like 181micrograms in the first few years of life, if I recall correctly). We know this doesn’t cause autism. Don’t expect the anti-vaxxers to give up a perfectly good talking point just because they’re proven wrong. Perhaps I can add a tiny bit of value. Researchers in Poland compared vaccination history and autism diagnosis in 96 children with autism, ages 2 to 15, as well as 192 children in a control group. For children [vaccinated] before a diagnosis of autism, the autism risk was lower in children who received MMR vaccine than in nonvaccinated children. A similar result was achieved for the single-antigen measles vaccine. fn1: Poland came later than the rest of Europe in vaccinating against measles, and introduced the monovalent and MMR vaccines separately; hence, there were three groups available for statistical comparison. There are other, equally valid and meaningful comparisons that may be made among groups in countries without Poland’s unique history. This study is worth pointing out simply because it knocks the props out from under one more silly anti-vaccination argument. fn2: This study found autism rates to be lower among vaccinated children, and lowest in the MMR group. There is ongoing discussion about just what this means, but it is kind of cool. World Health Organization: 3.3 micrograms of methylmercury/ kilogram of body weight/ week (0.47 micrograms/ kg/ day). Those are really low limits. Not only that, but the same limits set for methylmercury were applied to ethylmercury (thimerosal) although the latter is excreted more rapidly. Purely from the standpoint of mercury intake, vaccines were extremely safe even before thimerosal was removed. When the issue came up, many at CDC argued that there was no danger from the preservative, but great danger that removing it would permanently scare a subset of the population into distrusting vaccines generally, and that illness and death among infants and children would result.